Easy does it....as the young polar bear stealthily creeps up behind the dozing walrus, only one thought is in his mind: 'DON'T be seen, or heard! Haven't eaten in days....I can't miss this one!' Just a few feet away, the walrus suddenly wakes up and realises the danger - in a split second, with a flurry of flippers the walrus is over the edge of the ice and plunging deep into the Arctic sea! This is the story of a young polar bear who quite unintentionally finds himself on an epic voyage around the world, vaguely looking for food and wondering how to get home. In Part 1 of this series, the bear initiates his global odyssey by visiting north-eastern Canada, southern United States, the highlands of Colombia and Peru, the Galápagos islands of Ecuador and the Marshall Islands in the vast Pacific Ocean. Everywhere he goes, he encounters evidence of climate change on people, communities, ecosystems and wildlife. The bear also discovers the strategies that are already being implemented to reduce and adapt to climate change, making this a book more about solutions than problems. Part 1 closes with an epilogue that highlights some main climate change terms and concepts, as well as tips and ideas to become more climate savvy - in Polo's words, 'wherever you live and whoever you are!'. 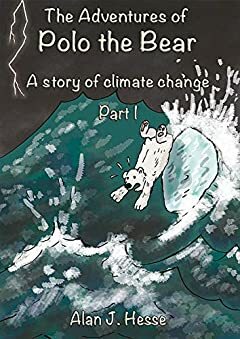 The comic format and artwork provide a fun and entertaining reading experience, making this book a key learning resource on the subject of climate change for readers aged 10 and above.